Episode 37 English. Ange is short for angel. Wo is short for woman. Angemon + Win Ratio 60% Her holy lightning attacks go right through the enemy! Has the power of "sky"
Angemon + Win Ratio 40% This holy Arch Angel shows her kind heart to those who do right. Has the power of "sky"
During the battle the opponent's Champion or Armored Digimon lose their special powers. She is not affected by "A goes to 0"
The attack adjustment of any support Digimon in her Protection Box increases by 200. Tailmon + Starmon She won't tolerate evil! 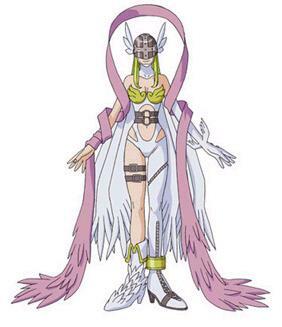 A beautiful angel Digimon! Has the power of "sky"
She is not affected by "A/C goes to 0"